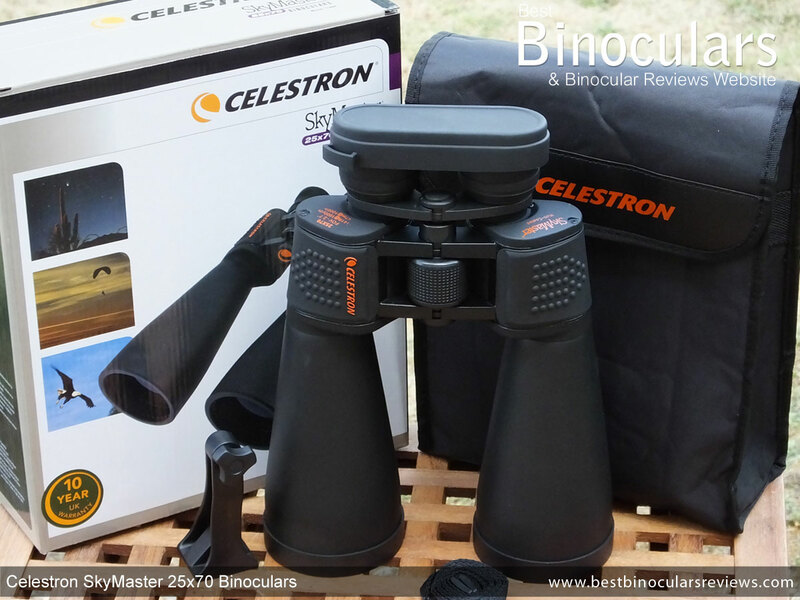 The range of Celestron SkyMaster binoculars have been synonymous with binoculars for astronomy and for long range terrestrial observation for many years now, but for one reason or another, it has been quite a few years since I last tested and reviewed a pair. I have also recently received a number of requests relating to these and other high powered bins and so I though that it was high time that I rectified the situation and tested a pair. Currently there are 9 models in the SkyMaster series, available in a range of configurations with everything from a comparatively small 12x60, right up to the giant 25x100, which means that you should be able to get the ideal one to suit your particular needs and wants. I was looking for a high powered bin that was also very versatile and so I decided to try out the 25x70 SkyMaster, because in my opinion, they sit on the cusp of what you can reasonably carry around and hand hold, but with a high powered 25x magnification they also give you plenty of reach and can still obviously be attached to your tripod. 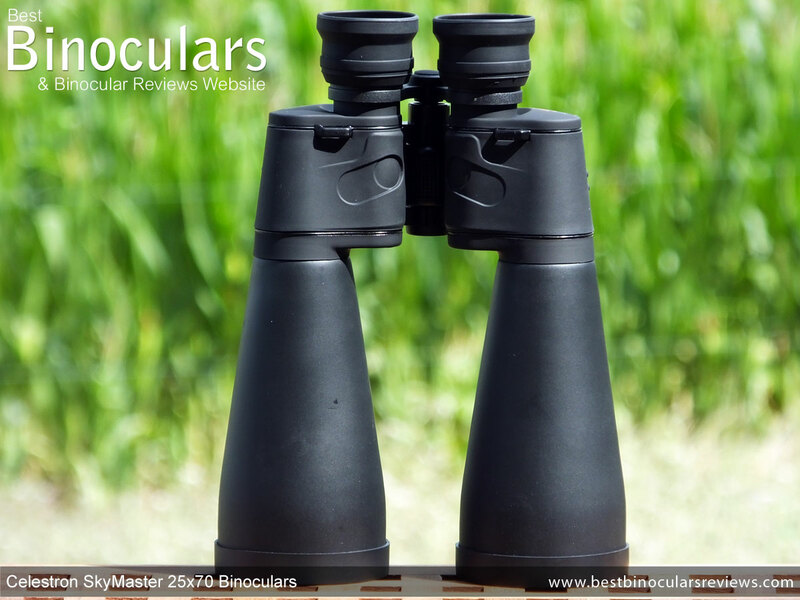 With a price tag of less than $90 / £80, they are what I consider to be a low cost binocular and indeed I think they are aimed at those looking for a low cost option for scanning the skies at night or over long distances during the day. I would say that in most cases this price level is probably about as low as you should consider going if you still want to achieve a reasonably good quality image, this is especially true with higher magnifications and so it will be interesting if Celestron have managed to not sacrifice too much quality by keeping the cost down to this level. If you ignore the very large 70mm objective lenses and the long barrels, the main body of the 25x70 SkyMaster has a pretty traditional looking porro prism design, with it's large centrally located focusing wheel, sandwiched between two of the three thin bridges that span the barrels. 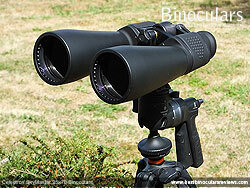 Also typical of a standard porro prism bino are the eyepieces that are positioned closer together than the objectives. This body shape has been tried and tested over many, many years and is one that makes for a very comfortable holding position that helps prevent fatigue when using bins over longer periods and which also helps you to keep them as still as possible for a shake free image. Celestron do not state what materials they use to construct the main chassis from, but as they are exposed, it is easy to see that the bridges are made from a type of metal. 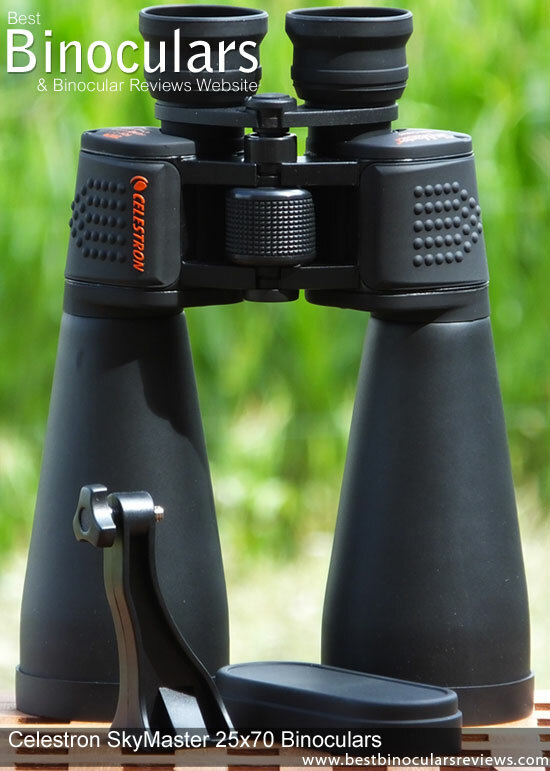 Many binoculars in this price range will have plastic bridges and whilst these metal ones may be heavier, they will also be much stronger and more durable, which considering the size and weight of each barrel, I think is important. With the rubber covering most of the body it is hard to see what the tubes of the barrels are made of, but to me, they look to be made from a polycarbonate, which is a low cost but lightweight option. Obviously I did not test them to destruction, but to me they look to be easily strong enough to take most normal, day to day bangs and bashes. Apart from the bridges and a few other details, most of the exterior has a rubber armor covering it. This rubber is quite hard and smooth and so does offer a little less grip than on some. However there is a textured area of raised dimples along the top section where you hold them using when glassing that does help with grip. Having a good balance when holding your bino is always desirable, but on a high powered and relatively heavy one like this, it is even more important. An unbalanced bin is harder to keep steady and will also lead to fatigue over longer periods of use. So to help with this, Celestron have also added a couple of thumb indents on the underside that are designed to direct you to hold them where you can get a good grip and easily reach and turn the focus wheel with your forefingers. On most binoculars this grip location is also at or fairly near to the balancing point on the device, but because the barrels are so long and the objectives so large on these SkyMaster's, I found that this is not the case on these and if you simply hold them at this point with your forefingers on the top and your thumbs underneath, they want to tip forward. However I soon discovered that if you also rest the palms of your hands on the underside of the barrels and keep your thumbs in the right spots, which comes quite naturally, they then do become well balanced at this point. I also sometimes found myself holding the barrels a point a little further down them which works well and you can get a really good steady and comfortable grip, but the downside to this is that you do need to move your hands to change the focus. Most 42mm binos in my experience inset their objective lenses about 8mm - 10mm inside the ends of the barrels, but these are located a full 16mm inside, which is very deep. This depth will do more to protect the lenses from gathering dust, light rain and from scratching them against objects. Another benefit is that the overhang acts like a lens hood on a camera, which means that it can help prevent or reduce any image flair from the sun. Fixing your binocular to a tripod can go a long way in helping you achieve a really stable platform for a shake free view, as well as free up your hands to do something else and take the weight off your arms enabling you to relax, which is important should you want to observe an area over a long period of time. Like the majority of binoculars I review, these SkyMaster's are tripod adaptable, but unlike most "standard", general use binoculars, the need to attach these to a tripod is far greater. This is because they weigh quite a bit more and have a much higher power than your standard 8x or 10x 42mm binocular and so any small movement is magnified a lot more by the high power. Luckily this Celestron SkyMaster is really simple to fix to your tripod as all you have to do is unscrew the small circular cap (with their logo on) located in the center of the front bridge and then screw in a binocular tripod adapter that uses the standard �-inch thread. This adapter can then be attached to directly to your tripod or tripod head depending on your setup. (For a demonstration, watch the walk-around video towards the end of this review). Celestron do include a pretty good adapter with this package. It is made from a hard plastic and has metal threads to prevent cross threading. For most full sized binoculars this adapter would be more than sufficient and whilst it worked fine on these, I did find that the extra weight and leverage of this larger binocular meant that there was some twisting movement when you aim and then stop the binocular on the tripod (you can also see this movement on my video below). This movement is soon canceled out when you place your eyes against the eyecups, but for the most stable view possible, I feel a metal adapter or at least one that was designed to counter this twisting movement would have been better. For those of you who are interested I was using my Vanguard GH-100 pistol grip attached to my tripod in the images pictured above. I find that this intuitive grip makes aiming your binocular or spotting scope in the direction you want so much easier and faster than most normal ball or pan heads that I have used and is one that I highly recommend. The soft rubber eyecups have an external diameter of 50mm, which like the rest of the binocular is larger than what you find on most standard bins. 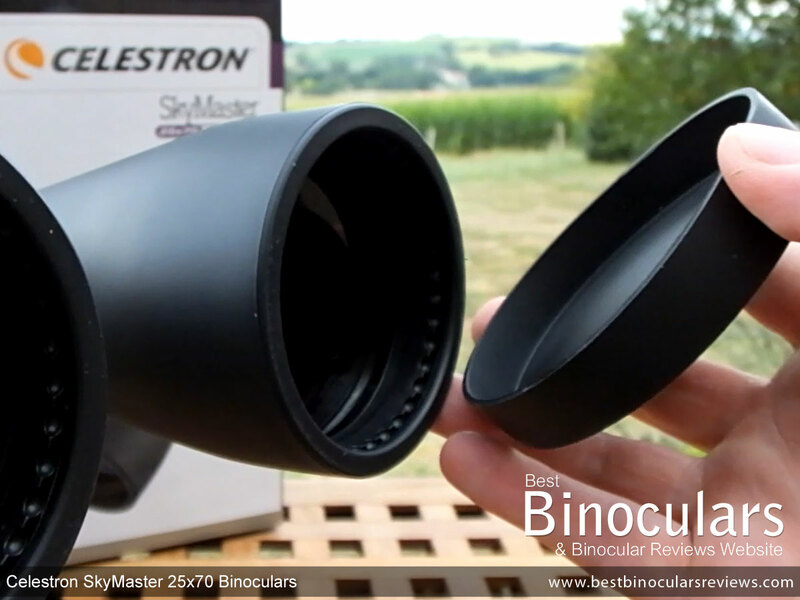 Instead of the more commonly used twist-up eyecups, the Celestron 25x70 SkyMaster has simple rubber eye-cups that you can roll up or down to adjust the distance of your eyes from the ocular lens to match the 13mm of eye-relief on these. If you don't wear glasses, you will most likely just keep these cups in the "rolled-up" position, whereas if you wear glasses, you need to allow for the distance that your glasses will add to the total distance between the ocular lens and your eyes and so you will roll the rubber eyecup down. These eyecups worked well enough for me, but I did find that I had to push them against my face quite firmly in order to get my eyes a little closer in order to see the full view, without any rings on the edges. Over long periods, this pressure did become a little uncomfortable. Indeed, maybe it is just the unique shape of my face that does not fit the larger diameter eyecups, but I did find that by rolling down the eyecups, I was able to get the full view much more easily by just lightly resting the binocular against my face. You can adjust the distance between the centers of the ocular lenses to match that of the distance between your eyes by opening and closing the central hinge. On these this inter-pupillary distance can be adjusted from a maximum of 7.2cm, right down to 5.6cm, which is nice and close and matches some of the best full sized bins out there, which means that these should be ideal for those whose eyes are fairly close set. At 33mm in diameter, the centrally located focus wheel is nice and large. This combined with the deeply textured rubber track that runs around it makes reaching it and turning it with precision nice and simple... even with thick gloves on. This is an important consideration if you use your bins in cold conditions, like when observing the heavens on a cold winter night. Whilst it turned smoothly, without any play, the resistance to movement was a fraction too tight for my personal preferences. As I say, this was not bad at all, just a tad tighter than what I would have preferred. To adjust the focus from it's minimum near focus to the other extreme of infinity takes just one full turn of the wheel (360°). This is less than many and so makes big adjustments comparatively quick, but also means that adjusting the fine focus is potentially a fraction more difficult than some as any small movement of the wheel moves the focusing plane just that bit further. I must say however that I never found it difficult to achieve a perfect focus with these. To make up for any variations of your vision in your left and right eyes and thus calibrate to your personal vision, most good binoculars will have a diopter adjustment. 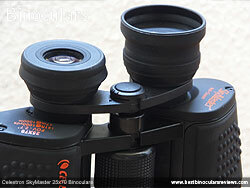 The most commonly used method is to have a ring on the right eyepiece that adjusts the focus independently to the left. Rather than a ring, you turn the whole eyepiece on this Celestron, moving it in or out, but it does the same job and works well enough. I will say that unlike the best, there is no ratchet, or locking mechanism to prevent unwanted adjustments and if your personal difference between your eyes is extreme, it will mean that the right eyepiece will be up to about 1mm nearer, or further (depending on the direction you need to turn it) to your face than the left. I tried this extreme and this difference did not seem to affect the eye-relief too much, so I do not think that this is anything to worry about. Whilst you can make your own marks, more printed markings or a scale would also have been nice as it would make it easier to remember and return to your setting should it be moved inadvertently or indeed on purpose if you share your bins with someone else who has different vision. Whilst the specification chart of the Celestron website says that they are waterproof, I think this may be an error as there are screws on the front face that do not look like they have fully airtight seals on them. I will try and see if I can confirm this, but until then I will have to assume that they are. If anyone knows for sure, please just use the comment box at the bottom of the page to let us know. What is for certain is these are not fogproof and so there is a small possibility that the inside glass surfaces could steam up if there is a lot of moisture in the air and you get a rapid temperature change, like observing the stars outside on a cold night and into your warm house. This is usually more of a pain than anything and will gradually go away, but is something to keep in mind. There is no argument that these and indeed most other astronomy binoculars are big, indeed with their 70mm objectives, I describe the as being "Giant Binoculars" and are much bigger than "Full Sized" ones. 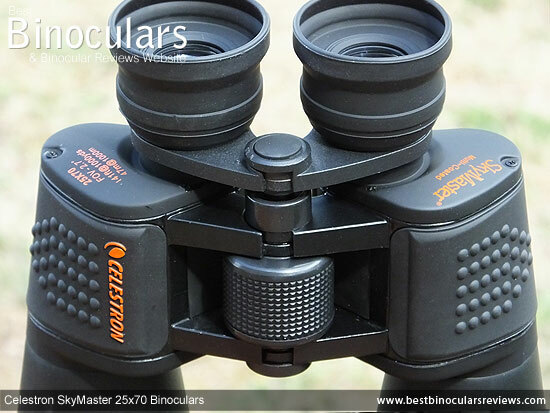 Celestron do not specify the dimensions of their 25x70 SkyMaster on their specification chart, but I measured their length as 25.9cm (10.2in) without lens covers and with the eyecups folded down, which is how most manufacturers advertise the length of their devices. This increases to 27.3cm (10.7in) with the eyecups folded up. Their maximum width with their hinge fully open is 21.5cm (8.46in) at this point their max height (depth) is 8.1cm (3.2in), by fully collapsing the central hinge, their width reduces to 20.4cm (8in) and because the focus wheel now protrudes up above the body, their height increases to 9.4cm (3.7in). 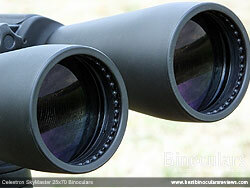 As with their dimensions, if you compare them to a standard full-sized binocular, they are quite a lot heavier, but as you can see from the table above they are also quite a lot lighter than many other giant binoculars on the market, even ones like the excellent and very popular Fujinon Polaris that also has 70mm objectives. These Celestron SkyMaster's have ocular lenses that are 23mm in diameter, which is around the same size as the larger ones found on most standard bins. The surface area of these 70mm objectives gives these binoculars much more light gathering ability than say your normal 42mm binocular, which is always a good thing. 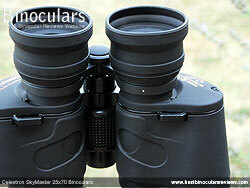 The trade off to larger lenses however is added size, weight and cost. These and all other 25x70 binoculars produce an exit-pupil that is 2.8mm in diameter (70 ÷ 25 = 2.8), which is fine during the day and in good light when that will pretty much match that of the size of the pupils in your eyes and so provide them with enough light so that you see a nice bright image. However in low light and very low light conditions, when your pupils dilate (usually between 5mm to 9mm), the smaller exit pupil means that they will appear less bright than a binocular with a larger exit pupil. So if we take the Zhumell 20x80mm SuperGiant or the Celestron SkyMaster 20x80 as an couple of examples, they have an exit pupil of 4mm (80 ÷ 20 = 4), which in theory means these will seem brighter at night, but you will also see less detail with the lower power and have a heavier instrument to use. The Zhumell Tachyon 25x100 and the Celestron SkyMaster 25x100 on the other hand also have 4mm exit pupils (100 ÷ 25 = 4) and you still get the added reach and image detail with the 25x magnification. However the huge trade off is the increased cost, size and weight (se table above). So as you can see there is no perfect solution, it is all about deciding what your specific wants and needs are and accepting that whatever you choose there are related strong points and weaknesses. The fairly small exit pupil on the Celestron also makes it just a little more difficult to line up your eyes exactly with the shaft of light exiting the eyepiece, failing to do so results in dark rings forming around the edges of the view. This is something that I did detect fairly often and you have to be more careful than those with larger exit pupils to set the IPD (Inter-Pupillary Distance) absolutely right.. 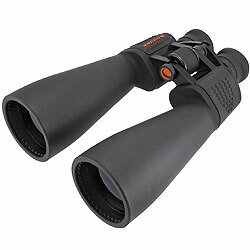 The Celestron SkyMaster binoculars all use use porro prisms made from BaK-4 glass, which is in most cases thought to be better than the BK-7 prisms that are quite often also found within this price range. On a low cost or cheap binocular like these, a porro prism design is also quite often optically superior than that of similar priced roof prism ones. The roof prism does have some advantages in that it's straight though shape allows you to make a more compact and streamlined binocular, but you also need to add a number of expensive coatings to it's surfaces to get the best out of it, which in this price range is either only partially or not done at all. Porro prisms on the other hand do not need phase correction coatings and because you get total internal reflection of the light waves, you do not need to add highly reflective coatings to it's surfaces and so they perform as well as much more expensive roof prisms. 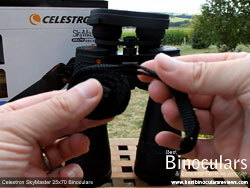 The Celestron SkyMaster 25x70 binocular has "Multi-Coated" optics. What this means is that some, but not all (usually the first and the last) of the optical surfaces have been coated with many layers of anti-reflection coatings that reduce or eliminate unwanted light reflections, which increases the transmittance or the amount of light that gets through the system and to your eyes than if they were left untreated. There are between 10 and 18 glass surfaces within most binoculars, all of which have the potential to reflect light in an undesirable way. 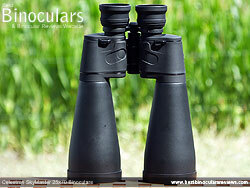 The best binoculars are "Fully Multi-Coated", which means every single surface has multiple anti-reflection coatings. A higher magnification gives you a further reach and more image detail, but on the flip side, it usually means that your field of view is reduced. 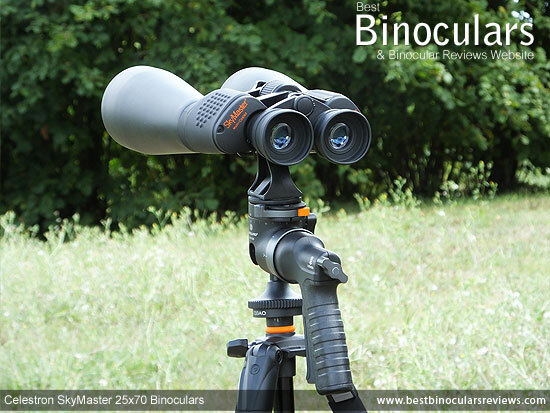 The 25x70 SkyMaster has a viewing angle of 2.7°, which translates to an image that is 47m wide at a distance of 1,000 meters (141ft at 1,000 yards). So whilst this is very narrow when compared to your average 8x42 binocular with a FOV of around 350 - 430ft at 1,000 yards, it is still a lot wider than what you get with most telescopes. This is why a binocular is great for scanning the sky and a telescope is great for focusing in on a single distant object. As you can see from the table above, they have a wider FOV than the 30x Barska, but their 25x power reduces their FOV compared to others with lower magnifications and is also lower than that of the 100mm 25x binoculars. But what you have to remember is that these will be heavier, bigger and more expensive. The higher magnifications also generally extends the near focus distance, but at 75ft, the minimum focus distance of these is better than many others in this class (see table above). Compared to an 8x42 binocular that can have a near focus of around 6ft, the close focus of these seems very far away, but focusing on near objects is not really what these long distance binoculars are about anyway. The 13mm of eye-relief is ok, but not great, for a binocular to have a long eye-relief, I usually suggest a distance of at least 16mm. This means that some, but not all those with glasses may have enough room to play with in order to get the full image without any halos or dark rings around the edges. With all my reviews, I use a range of my benchmark binoculars, to test and compare different aspects of the view through the bin under review. However with these, it was a little different as I did not have a similar pair with me to compare them against, so I used a couple of my 8x42 benchmarks as I thought it would be interesting for those who have a standard bin, to know how they compare to these. The colors look nice and natural, without any artificial tints, but are less vivid than on my benchmarks. In good light, the image contrast looks good, but because the image was less bright than that of my controls, it looks as though the amount of contrast is less. My control 8x42's have an exit pupil of 5.25mm (42 ÷ 8 = 5.25), which is plenty bigger than the 2.8mm (70 ÷ 25 = 2.8) ones on these. So it was no surprise that the image I could see through my top end and my mid level 8x42mm controls was brighter than that through these. This difference was very small in good light and when comparing them to my average 8x42's, but was far more noticeable in poor and very poor light when the pupil in my eyes would have dilated and been quite a bit larger than the exit pupil on these Celestron binoculars. This is always the problem when you increase the magnification on a binocular as even with very large 70mm objectives, the exit pupil is pretty small. With such a long minimum focusing distance, it was harder than normal to look for any color fringing around the edges of objects caused by chromatic aberration as I usually find it easier to spot on nearer objects. 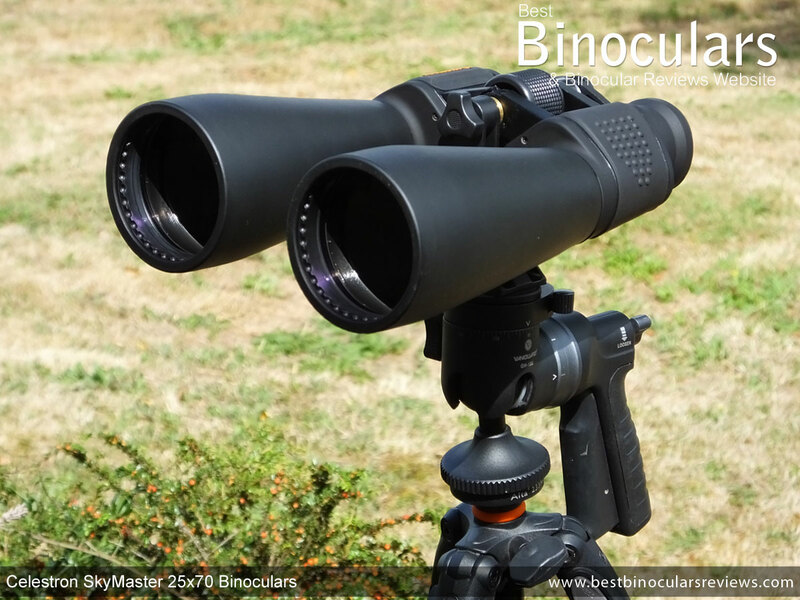 What ever the case, the amount of color fringing was very minimal and only really noticeable when you are really looking for it, which is excellent for a binocular in this price range. The amount of softening of the image at the edges of the view was also very minimal and less than what I would expect to find on a binocular within this class range. The overall image also looks nice and flat and stays in focus from the center of the view right until the edges where this minimal softening occurs. Again with such a comparatively far minimum focusing distance and a much narrower field of view, it was not really possible for me to compare and therefore judge the depth of view between these and my 8x42's. I would say though that their depth of field seemed good enough, with it never being an issue for me. Because many people who are considering these will be getting them for astronomy, I thought I would pass on what you can expect to see when looking at the night sky through them. These observations were on a night with a moon that was almost full and a fair amount of light pollution, so I am sure it would be possible to see more if the conditions were better and with more experience of where to look! 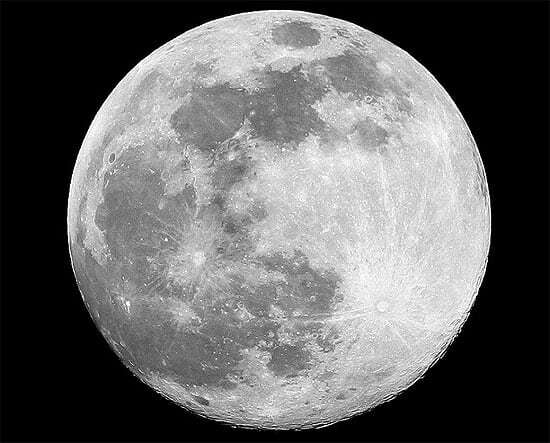 You get some fantastic, clear and crisp views when looking at the moon, especially if it is large and full, it almost completely filled up my field of view and whilst a tripod was not necessary, it really helps keep the image steady and gives your arms a rest during longer periods. Looking at smaller deep-sky objects, like planets, stars and clusters a tripod is pretty much essential to keep the view steady enough. As expected, Mars is easily observable as a small red ball, but you can't really make out any other features than that, but am told that in better conditions you may be able to make out the basins from the red areas. Jupiter is also observable as are it's moons which is great, but once again observing any features on the plant was not possible, but once again I think in better conditions you will be able to see the Great Red Spot on the planet. Seeing the iconic rings around Saturn is a great feeling, but it is difficult to see where the rings separate from the planet. For me the the Orion Nebula appeared as a very faint grey blotch, but once again think it may be possible to see more on a better night. Whilst it looks to be reasonably well made, the soft carry case is very flimsy, with only the thinnest amount of padding and so will not protect the binocular much should they be dropped. The top flap is held closed with a strip of Velcro which holds very well, but makes a huge noise when opening it, which to be fair is not such a great deal with these long distance binoculars as whatever you are about to look at will probably be a fair distance away and not be frightened off. The case does not have any separate pockets, but does come with a simple, un-padded shoulder strap. 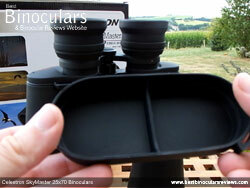 On the whole and compared to the binocular, the case is a little disappointing and even though it is a low cost binocular, the fact that these are larger and heavier than most regular bins, I would have liked to have seen a lot more padding on the case to protect them more. Without any padding at all and only 8mm wide, it has to be said that the neck strap is very basic. This is not that uncommon in this price range, but for such a large heavy binocular I would really have expected to see a much better padded and wide strap that would make carrying them far more comfortable. Perhaps Celestron assume that these will be mounted on a tripod most of the time, but I think the fact that they make such good long distance terrestrial bins and you can hand hold them, means that I think they are missing a trick here. Made from a soft, flexible plastic/rubber, the objective lens covers fit fairly snugly over the ends of the barrels and so do not come away accidentally too easily. Unlike many binoculars these days, they are not tethered to the binocular and so you have to remember to put them somewhere safe every time you remove them, so as not to loose them. This would have been nice, especially if you often use them outdoors at night, where it can be a bit of a pain to search around in the dark looking for the covers. The rainguard or the eyepiece cover, like the objective lens covers is made from a soft rubber, but unlike those, it does not fit as well and easily comes away from the lenses. It also is a single piece, without the flexible bridge found on many others, so other than the eyecups moving inside of it, it does not really accommodate the different Inter-Pupillary Distances that you may have the bin set at. The cover does have a loop on the right hand side that you can thread the neck strap though to keep them handy at all times. The SkyMaster comes with a basic cleaning cloth that will be fine for a simple clean, but I would suggest getting a proper optical cleaning kit for a more thorough clean and to be sure that you don't damage the lenses or their coatings. This Celestron SkyMaster binocular that I tested, comes with a 10 year UK guaranty and the booklet has details of the limited lifetime warranty for US and Canadian customers. The instruction booklet that is included is very basic and generic for the Skymaster range. It has the usual details on how to adjust the inter-pupillary distance, change the focus, set the rubber eye-cups, attach it to a tripod and how to care and clean the bins. 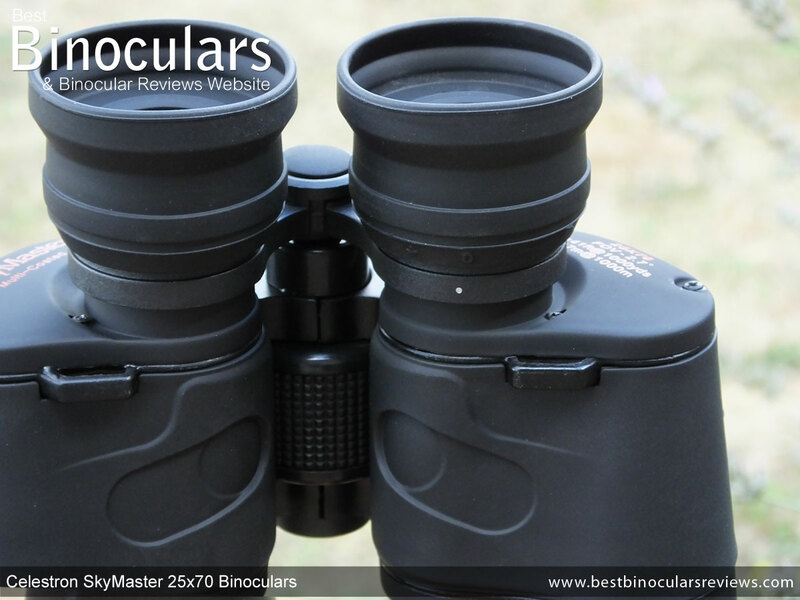 Strong Points: I have read many articles and pieces of advice on forums written by so called experts claiming that you cannot get a stable view from any binocular with a magnifications of around 15x and above. This is simply not true, the relatively low weight and good balance of these (once you hold them right) means that I was easily able to look through them over fairly long periods using nothing more than my hands during the day. Sure you get a more stable view using a tripod and possibly people with shaky hands may find it difficult, but I would say that the average fairly fit person should be able to do the same. This for me is a real strong point as it opens them up to a wide range of uses (see below). At night and when using them for astronomy it is different, here you really do need a tripod to get the image steady enough for you to get as good a view as possible when looking at the stars or the moon. Also without a tripod, I found that my arms got tired and began to ache much more quickly when looking upwards. Weak points? 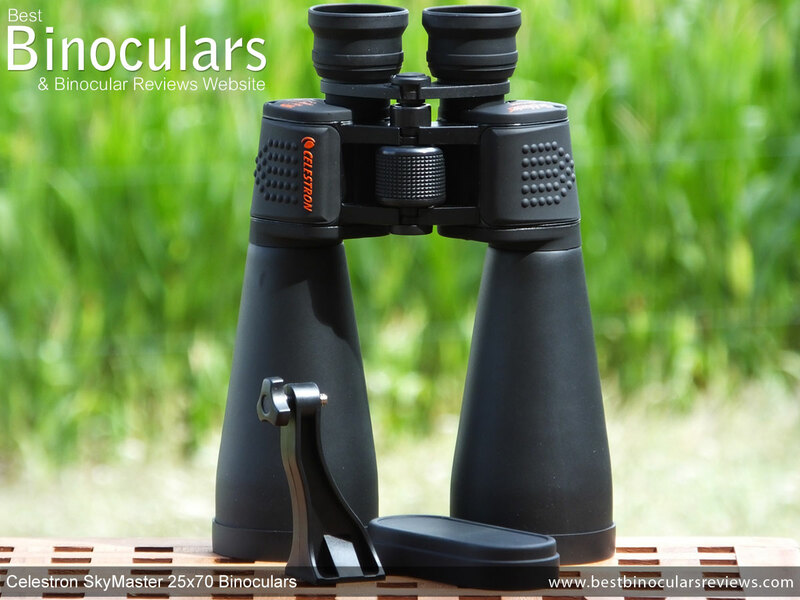 To produce a low cost binocular, manufacturers have to make some sacrifices to keep the costs down and so like many in this class, the quality of the extras like the carry case and the neck strap is poor when compared to higher priced models. However having said that they do just enough and to be honest I would rather see them making cuts in this department than making more sacrifices to the quality of the actual binocular. The eyecups and the eye-relief for me were also not the greatest. This combined with a small exit-pupil meant that I was often searching to get the full view, trying to get rid of the dark rings around the edges. 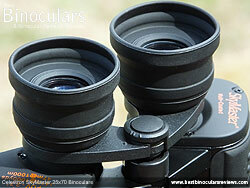 I think better quality twist-up eyecups set at the correct amount of eye-relief would really help in this area. Ideal For: As I mentioned earlier under the strong points, the fact that they can be hand held for terrestrial use is fantastic. It means that as well as being pretty good binoculars for astronomy, they are perfect for a number of long range uses during the day. Specific areas that I can think of include good plane spotting binoculars, where using a tripod makes it very difficult to follow the moving aircraft. Likewise they would be ideal for long distance puffin, seal & whale watching and great for watching sailing or ships, once again at longer distances and where you may not want to use or carry a tripod with you. The great thing is that they can of course also be mounted to a tripod, so when you have a fixed or slow moving target, like the moon, a distant ship or are an area far off in the distance the added stability of a tripod means that you can get the best result possible. As for astronomy, you do get plenty of reach and image detail when compared to most other astro binos that generally have a lower power, but to get this you do sacrifice the width of the view and the smaller exit pupil means that they are not as bright as the lower powered ones or those with larger objective lenses. Sure they may not be perfect, but I do believe that they are quite a lot better than their price tag and as such they are better than most in this class and make a great low cost option if you are after a high powered astronomy and terrestrial binocular. I would also like to say a quick thanks to Hama (UK) Ltd, the UK distributor of Celestron binoculars for sending me these to test and review. Unlike many phony reviews out there, I wrote this Celestron SkyMaster 25x70 binocular review after actually using and testing them over many days (and nights in this case), both out in the field and in my office. I would also like to make it clear that the views expressed are completely my own, honest opinions and I have not, nor never will be persuaded to write in a certain way. I also spend a lot of time researching every product I write about and I do my best to ensure that all the facts and figures are correct, but I have been known to make the occasional mistake, so if you spot any please feel free to let me know.